Join us March 26th from 6:30 to 11pm at the Historic Franklin Room, located in the heart of Soulard, for an evening filled with New Orleans style music, cuisine, and libations. This is a First Annual "kick off" event. Please help be a part of it. 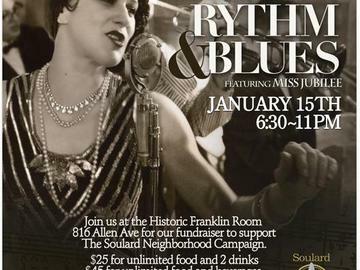 Proceeds benefit the Soulard Alliance: A collaborative effort of residents, businesses, and non-for-profits to launch a PR campaign to highlight the Soulard Neighborhood with all its unique qualities. Come find out how Soulard is MORE than just a great place to hang out. For more information on Soulard, go to www.SoulardEvents.com.